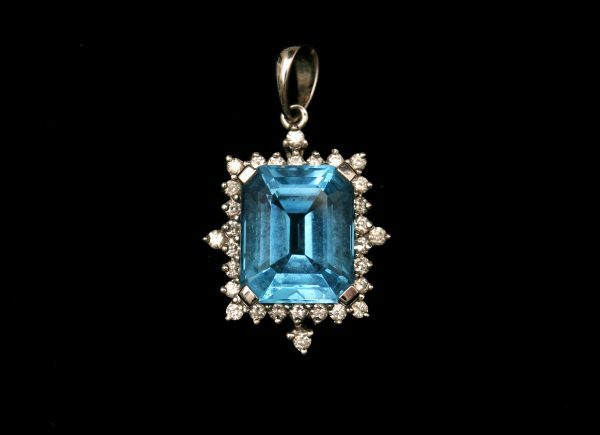 Lot 208 – A 14K White Gold Blue Topaz and Diamond Set Pendant, the central emerald cut stone, approx 7.5 carats, surrounded by twenty eight small diamonds, approx 0.56 carats. Guide Price £ 150 - £200. (Plus Buyer's Premium of 18%, Including V.A.T.). Guide Price: £400-£500 (Plus Buyer's Premium of 18%, Including V.A.T. ).